This is the order page for the Five by Five USA FCC (Amateur/Commercial) and/or Canada Amateur test PC Software. While you will be asked in a later step whether you want to add our Five By Five test prep MP3 audio review to your PC software order, if you don't want the PC software and ONLY want the MP3 audio, click here. Thank you for your interest in registering/purchasing Five By Five and PilotMorse software for PC. You're only a few moments away from purchasing access to Five By Five test prep software. As a special bonus, with your Five by Five purchase, you will receive a free license to PilotMorse, our aviation Morse code tutor software. Please choose the PC software variation of your choice below and then click on 'continue.' After you place your order (in 99.9%+ of cases) your activation codes will be delivered to via email immediately, allowing you to study right away. You can get more details about each of the pacakges both by reading the green box below and also by clicking the "What's Included?" button next to each item. You might notice that our best value bundle includes both US and Canadian test preps together and it costs only a tiny bit more than our USA-only package. We strongly suggest you get this as it'll be a great source of additional study practice and it'll also prepare you for the actual Canadian Amateur Radio tests should you ever feel the need. Please read the "Why Canada?" red box at the bottom to find out more about this. Our Five By Five test prep products contain 100% Current, Up-to-date, actual questions just like you will see on your actual test. These are regularly updated to correspond to USA FCC and Canadian test bank changes and UPDATES ARE FREE FOR LIFE using the built-in self update feature. Occasionally, we may include older tests as part of the package for people who want extra practice or challenge; most people can safely ignore these. Additionally, at times near the activation of a new question pool, you may find two 'active' test pools for a given test - one that is current for now, and one that will be active after a given date. In this case, simply study the one that corresponds to the date when you want to take your actual test. Please strongly consider taking advantage of the best value package (Five by Five FCC Amateur, FCC Commercial, and Canada Amateur, plus free PilotMorse) now, as you will NOT be able to retroactively upgrade in the future. It only costs a bit more and it comes with free lifetime upgrades meaning that when it comes time to study, the software will be there for you. The USA FCC Commercial + USA FCC Amateur + Canada Amateur (Ham) Radio Five by Five package is the best value. With this, you get full access to ALL of the FCC And Canada test prep materials in Five by Five. We strongly suggest that you purchase this package, since if you do not purchase this now, there is NO low-cost upgrade to the bundle in the future. Remember, you get free lifetime upgrades for all included material with this bundle, so please strongly consider getting this complete package now (it costs only a little bit more than the individual packages). The FCC Commercial + FCC Amateur Five by Five package will get you full access to ALL of the USA/FCC test prep materials in Five by Five but NOT the Canadian test prep. We suggest that you purchase this package, since if you do not purchase this now, there is NO low-cost to the Canadian test prep in the future (see the "Why Canada?" box below). Remember, you get free lifetime upgrades with this software, so please strongly consider getting this complete package now (it costs only a little bit more than the individual packages). The Commercial-only package will prepare you for any or all of the USA/FCC Commercial written tests included in Five by Five including GROL, GMDSS, and more. Click on the "what's included" button to see exactly the included elements/tests. The Amateur-only package will prepare you for any or all of the FCC Amateur (aka Ham Radio) tests included in Five by Five. This includes preparation for the Technician, General, and Amateur Extra tests. The Canada Amateur Radio package will prepareyou for any or all of the Canada Amateur Radio test preps included in Five by Five. This includes preparation for Canada Amateur Basic and Canada Amateur Advanced tests. It doe not include prep for any USA/FCC tests. Why Canada? - The Five by Five USA FCC Test prep software will prepare you for USA Amateur and/or Commercial tests. Why do we include the Canadian test as part of this? Our best value bundles include preparation materials for both levels (Basic and Advanced) Canadian Amateur radio exam tests. Just as with our USA FCC test preps, the questions included are actual questions just as you will see on the real tests. We offer the Canadian test preps as an add-on to the US test preps at a very modest price for two reasons: One, some US amateurs may want to take the Canadian exams at some point just for the fun and challenge. Two, while the Canadian exam banks have a few quetions that are specific to Canadian regulations and practices, most of the questions there are general amateur radio questions that can provide practice, challenge, and knowledge to US amateurs. Think of it this way: for only a few bucks more you get a bunch of additional questions that you can use to improve your overall ham radio knowledge and skill, especially as the Canadian exams touch on a a few technological areas that the US exams don't. It's only a few bucks when you buy it together with your FCC/USA test preps but this special highly discounted pricing is only available if you buy it in this bundle - you won't be able to simply 'pay the difference' later. We welcome you to take advantage of this great deal at this opportunity. Please make sure you are getting the right thing! 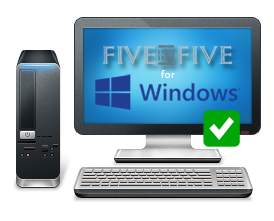 This is the page to purchase 5x5 for systems that run the Microsoft Windows operating system. This is not the place to purchase 5x5 for your iPhone or iPad. If you'd like the iOS app version for your iPhone, iPad, or other iOS device, click here. This is not the place to purchase 5x5 for your Android. If you'd like the Android app version for your Android phone or tablet, click here. This is not the place to purchase 5x5 for your Mac PC. If you'd like the Mac app version, click here.